It has been nearly two years since Principal and Vice-Chancellor Daniel Woolf acknowledged Queen’s presence on the traditional lands of the Haudenosaunee and the Anishinaabe Peoples during a special meeting of Senate on March 7, 2017. 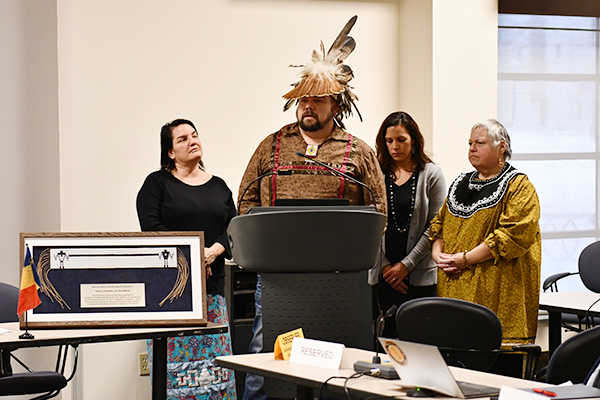 During the meeting, held as Queen’s marked the 175th anniversary of the university’s first class, Principal Woolf was presented with a friendship wampum on behalf of the Clan mothers at Tyendinaga and the Katarokwi Grandmother’s Council. The belt is now placed at the head table during every Senate meeting as a reminder that the meetings take place on traditional Anishinaabe and Haudenosaunee territory and as a reminder of the commitments made to each other during the presentation of the wampum. The message has not been forgotten. During the meeting of Senate on Tuesday, Jan. 29, the promise of the friendship wampum was reconfirmed with another special ceremony. Referred to as ‘polishing the chain,’ the ceremony is a reminder that the relationship between Queen’s and Indigenous peoples is ongoing and not just a moment in time. Speaking first in the Mohawk language and then English, Karihwawihson (Joe Brown), Turtle Clan, a Traditional Knowledge holder from Kenhteke/Tyendinaga Mohawk Territory, explained the significance of the ceremony and the importance of staying connected. In response, Principal Woolf reconfirmed the university’s commitment to foster a stronger relationship and to promote communication between all involved. The special Senate meeting of March 7, 2017 was a pivotal moment in Queen’s history. Along with the acknowledgement of the university’s presence on the traditional lands of the Haudenosaunee and the Anishinaabe Peoples, Principal Woolf reiterated the university’s commitment to building good relations with Indigenous peoples and creating meaningful change on campus. Providing further impetus for this important initiative, the final report of the Queen’s Truth and Reconciliation Commission Task Force was released a few weeks later. The task force issued 25 recommendations including establishing an Office of Indigenous Initiatives, creating new programs to increase post-secondary access for Indigenous youth, ensuring more Indigenous representation in administrative roles, and creating culturally validating spaces that recognize and honour the university’s location on the territory of the Anishinaabe and Haudenosaunee peoples. In response, Queen’s created the Office of Indigenous Initiatives and Kanonhsyonne (Janice Hill) was appointed as the inaugural associate vice-principal (Indigenous Initiatives and Reconciliation). Other projects on campus include the recent expansion and renovation of the Four Directions Indigenous Student Centre and the unveiling of a plinth dedicated to the Anishinaabe and the Haudenosaunee peoples. Queen’s also continues to raise awareness of Indigenous-focused research occurring on campus and with Indigenous communities and is working to include “significant and meaningful” Indigenous content in the classroom. For more information on the full complement of Indigenous Support on campus, visit the Inclusive Queen’s website.